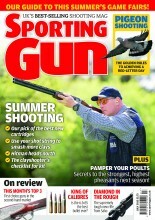 Should the farmer pay me for pigeon shooting? I know the late Archie Coats used to get help with cartridges, but I am afraid that was more than 40 years ago. Farmers are a bit cuter these days, and if anything, are likely to ask YOU for a contribution! There are any number of shooters out there who would be only too happy to come and shoot pigeons at a moment’s notice, many of whom are prepared to pay for the privilege. I think if you asked your farmer to buy cartridges for your use, and he was in a really good mood, he would say… “Goodbye”.